A hexagon dumbbell set consists of the optimal gym weights whether you’re using it for fitness, strength building, or bodybuilding. The hexagonal shape is ideal for dumbbells as it prevents it from rolling which can be a safety hazard when you’re working out. But not every hexagon dumbbell set is created equal. 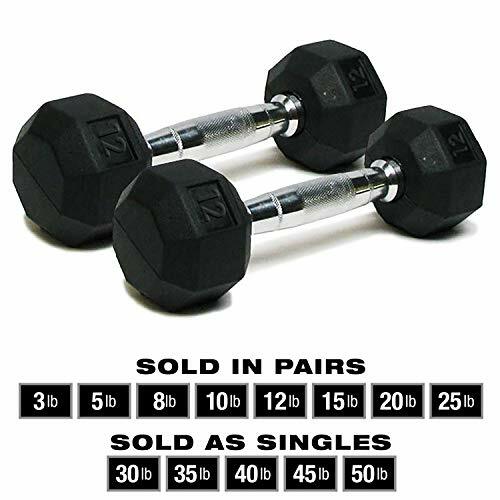 Therefore, we’ve looked for dumbbells sets that are durable, ergonomic, and easy to grip. Here are the best 5 models choices that we’ve found. The SPRI Deluxe Rubber Dumbbells are hexagonal dumbbells with a thick rubber coating. The rubber coating ensures extra grip in case of slippage while also protecting flooring. The rubber is also nice because it is quieter than regular steel weights. This weight set is designed to be durable while the rubber will not peel easily like in other cheaper weight sets. 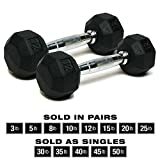 Best recommended for: People who are looking to get equipment for bodybuilding or strength training but do not want to invest in a fully equipped dumbbell set. They can choose the right pair of weights to start with and go from there. 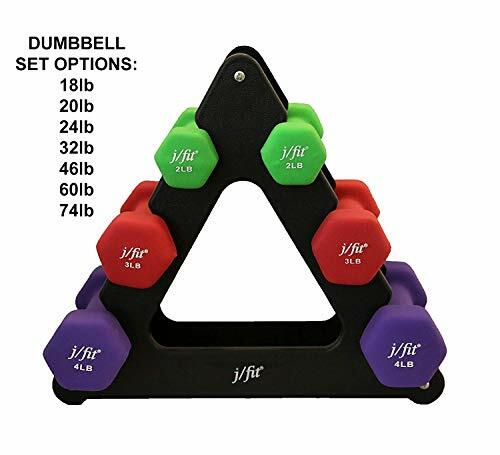 The j/fit Dumbbell Set w/Durable Rack is a hexagonal dumbbell set that’s perfect for recreational use. It’s great for pilates, aerobics, conditioning, and for rehabilitation exercises. The double coated neoprene material protects the steel from chipping and rust ensuring that your weights last for a very long time. It also reduces damage to yourself and flooring in case of accidental drops. The CAP 150-Pound Rubber Hex Dumbbell Weight Set are the perfect set of weights if you want a wide range of dumbbells that are affordable. The hexagon dumbbell set dumbbell set is coated with rubber and has a based of cast iron. The CAP model also comes with a space-saving A-frame rack that does a great job of holding the weights. This set starts from 5 to 25 lbs, making it perfect for beginners. However, experienced bodybuilders and strength trainers will obviously want heavier weights. 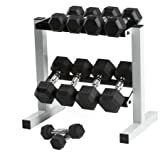 Best recommended for: People who are starting their bodybuilding program and want an affordable weight set that’s also reliable. This is a great budget friendly weight set that both bodybuilders and strength trainers will get value out of. 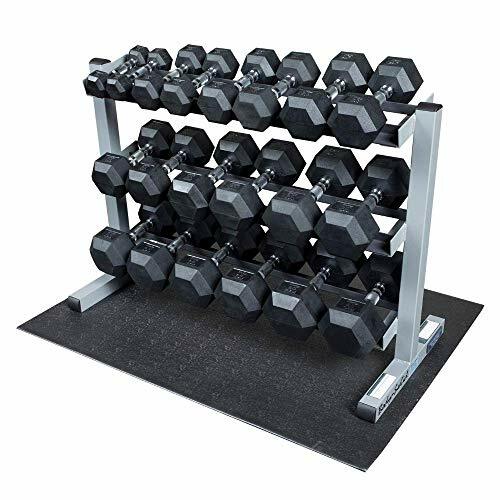 The Body Solid GDR363-RFWS Dumbbell Rack with Rubber Dumbbells is a great set of weights for bodybuilders. It comes with the dumbbell pairs, weight rack, and a rubber mat. This hexagon dumbbell set is equipped with a pair of weights from 5 to 50 lbs. The grips are lightly knurled for a better grip while the rubber material is made to be durable. Best recommended for: People who are looking for a full set of dumbbells for their bodybuilding regime. The Rep Rubber Hex Dumbbell Set with Racks is a full dumbbell set just like the Body Solid set. However, this hexagon dumbbell set offers a wider range of weights and a different handle design. The handle itself is a full knurled straight handle which is designed to fit many different types of hands. On top of that, the thick (but not too thick) handle is comfortable for most people. It comes with a nicely designed rack that is perfectly inclined to pick up the weights. It is also priced very competitively compared to other similar models. 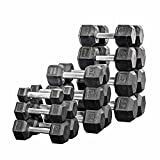 These dumbbell sets are all highly rated in their category. Obviously, it’s up to you to choose the hexagon dumbbell set that’s right for you. Think carefully about what you’ll be using them for and choose the one that fits into your budget. You’ll also want to compare the pros and cons of similar sets to notice the small differences and make a more informed purchase decision.